Prague is a city with a uniquely preserved historical center that belongs to the UNESCO World Heritage List. If offers amazing architecture, featuring Romanesque chapels and cellars, Gothic cathedrals, Baroque palaces and gardens, Art Nouveau buildings and unique Cubist buildings. – In which hotel to stay? 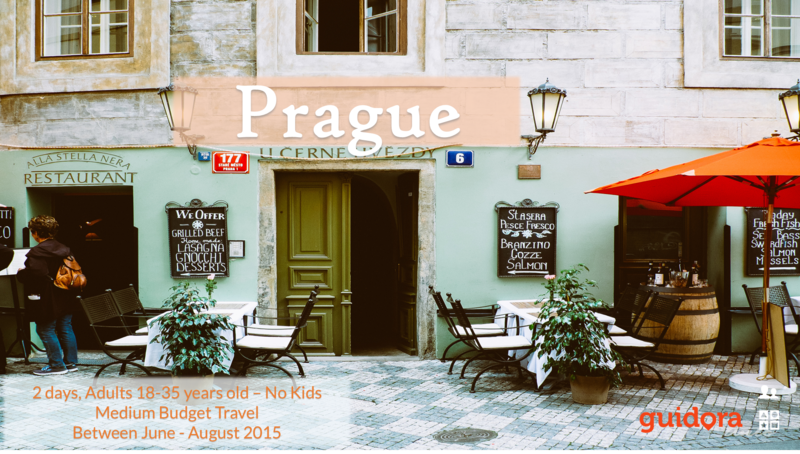 What is the best value for money hotel in Prague, that will help you be in the epicenter of all activities? – Where to eat. What to try from the local cuisine. – What Places to see. How to get there and how much it costs. – Where to go out in the evening. Best bars and clubs for each time of the year. – A detailed hour-by-hour perfect plan, with suggested activities and all maps and information included. It’s just like having your best friend in Prague, showing you around to the best that the town can give you. Get this travel itinerary now, save time and money from organizing your trip but most importantly, enjoy this experience to its fullest! If you want to have a look at how a Guidora Travel Itinerary Guide looks like, before you purchase, feel free to download for free our Travel Guide for a tour of Turkey. The same concept applies to all our travel guides. Just click below to get your free sample! Sounds good? Get it now!